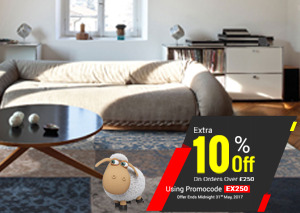 SPECIAL DISCOUNT is now on, get EXTRA 10% Off on any order over £250 using promo code EX250. Now is the best time to give your floors a dashing look with our wide range of stunning rugs. Hurry! Offer valid till Wednesday 31st May, 2017. If a Partial Return has been raised after receiving the items, then this offer won't be applied to your order and the refund will be done accordingly. Please note this offer of 10% off on orders over £250 is valid on single transaction only.